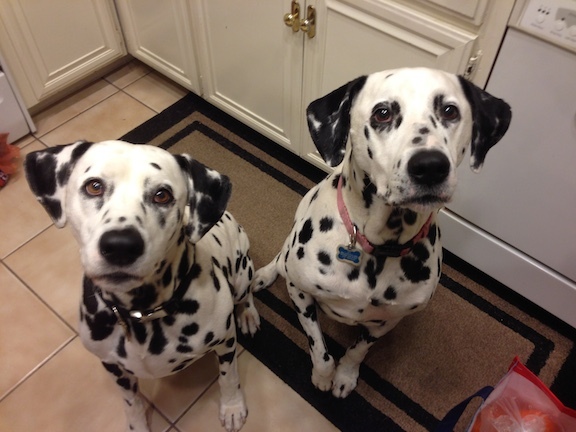 Chopper (Left) and Gia are a pair of Dalmatians that live in Southern California. Their owner reached out to me for help in teaching the dogs how to use a treadmill. Although teaching dogs to use a treadmill is more of a training situation, I never turn down a chance to work with Dalmatians! When I arrived for the session, both dogs were behind a door in another room. When their owner let them out they rushed over to greet me with some barking and deep sniffing. While they did not jump up on me, neither dog showed much respect for my personal space. Chopper seemed more engaging while Gia would approach then circle away practicing some avoidance. When I sat down with their owner to discuss the session, the dogs went from investigating me to the side of their owner before repeating. Each time they were within arms length of their owner, she reached over and scratched or petted them. While petting a dog is usually a good thing to do, providing attention to a dog when it is in an unbalanced state of mind actually reinforced the unbalanced state. I suggested that their owner start petting her dogs as more of a reward for following a command or direction. By petting a dog after it sits, lays down or comes, we can use positive reinforcement to help condition it to follow commands. I called Chopper over and gave him a sit command. It took more encouraging than it should for a ten year old dog, but once he sat down I started to scratch him under his chin while repeating the “sit” command. As soon as I started to pet him, Gia came over and invaded my personal space to let me know I should be petting her too. I used some body language to communicate I wanted her to give me some space. Because I was using a communication method that she understood, Gia responded immediately and moved a few feet away before sitting down. Her owner gave her daughter a surprised / “can you believe that” look which told me that we needed to go over some basic communication methods. I don’t believe in punishing or striking a dog when it misbehaves. Instead I like to apply a set of escalating consequences that I can use consistently. • Using a sound to communicate “No,” “Don’t do that,” or “Don’t even think about doing that.” The sound I use is a hissing sound like a cat would use. This is a warning and not a consequence. But by always starting out with the same sound to communicate no before using the consequences, the dog knows what is coming next if it doesn’t obey. • If the sound doesn’t work, the next step is to stand up abruptly and turn so that your hips and shoulders are facing the dog. If it moves to the right or left, you need to pivot so that you continue to face the dog no matter where it goes. • If standing up doesn’t stop the behavior, the next step is to march directly at the dog. You need to be sudden and deliberate in your movements. Slow and cautious movements are interpreted as weak and are often ignored. The dog needs to think “If i don’t get out of her way, she is going to run me over.” I march at a dog this way until it turns away or sits down. • The third escalating consequence is to put the dog on the leash and stand on it a foot or two away from its head. This is the dog equivalent to a “time out.” Usually a dog will pull on the leash to get away for a minute or two then sit down. Once the dog returns to a calm balanced state of mind, I take my foot off the leash without any fanfare. I do this so that the dog doesn’t notice and leave the leash attached. Usually the dog will continue to lie there for a few moments before getting up and calmly walking away. Now if you use this technique, make sure that the dog is supervised while its dragging a leash to make sure it doesn’t get caught on anything or hurt itself. Once their owner started to use these communication techniques, the dogs response to their corrections seemed to improve. There will be setbacks, but its important that their owner consistently uses these new consequences for the next week or two to really change how the dogs respond to their commands and corrections. Now it was obvious that the dogs loved and trusted their owner, their respect for her authority was lacking. Applying the escalating consequences and petting as a reward for following commands will help in this regard, but to accelerate the process I went over a leadership exercise too. It only took Chopper a few repetitions before he got it. But when it was Gia’s turn, she had a little more difficulty. While she understood one part of the exercise, the second part was a bit much for her. We had to do a little more encouraging that I like to get her to come over and take the reward at the end of the exercise. This along with her interactions told me that she has lower self esteem. To boost Gia’s confidence I suggested her owner teach her some simple tricks and commands. Dogs are similar to humans as we get a sense of pride or feeling of accomplishment when we master a new skill. By teaching Gia how to roll over, play dead, balance a cookie on her nose etc, her confidence will grow and she will become calmer in stressful situations. After going over these behavior issues, I started to work with getting the dogs on the treadmill. Now as I mentioned earlier this really falls under the training label, but I have taught many dogs to use a treadmill to burn off unwanted energy. But in this case, her owner had purchased a dog version of a treadmill which had a longer track and flaps on the sides. Earlier in the session Gia had stepped onto the track to get closer to me and I used that opportunity to toss a few treats on it to gauge her reaction to the treadmill. While she was slightly cautious, her desire to get the high value treats motivated her to walk up to the top of the track multiple times while it was off. But once we turned the tread mill on, both dogs grew anxious. We spent about 20 minutes going through various methods to get them on the track with minimal success. Because pent up energy was a contributing factor, I asked if we could take the dogs for a walk. “You mean together,” her owner asked me with wide eyes. Because of an incident with a neighbors dog and pulling on the leash, her owner hadn’t been walking the dogs nearly as often and no longer together. As soon as we pulled out the leashes, both dogs energy levels went up considerably so I stopped moving. I suggested that their owner stop or pause in the same way any time their dogs start to get over excited. When you leash up a dog who is in an excited or anxious state of mind, they continue on with that same energy or anxiety. By stopping and waiting until the dogs return to a calm balanced start of mind before continuing, we can help them adopt a calmer more balanced nature on their own. Once they were calm, I fitted both dogs up with a Martingale collar and added my special twist to the leash. Her owner had been using prong collars which helped their their pulling, but did not stop it. While there is nothing wrong with a prong collar when used correctly, it is an extreme tool and because it wasn’t stopping the pulling, I wanted to see if the reliable Martingale would do the trick. When we got to the door, the dogs were starting to get excited again, so we paused before continuing. During this pause, their owner expressed some concern about walking them together again. Dogs are extremely perceptive. When they sense that we are anxious or in an unbalanced state, they often change their energy level or mental outlook as well. This is why its so important that owners adopt a confident energy when leading their dogs. Because her owner didn’t have this confidence with the walk due to past experiences, I took both leashes and we went out as a group. Once we passed the doorway, both dogs started to pull a bit so I gave a small correction with the leashes. As usual, the twist to the Martingale collar / leash did the trick and stopped the pulling immediately. Once we were away from the house, I handed on of the leashes to her owner and instructed her on how and when to apply any corrections. I took about two minutes before Gia and her owner both looked calm and moved in harmony together. Once I was sure that they were both confident and comfortable in what they were doing, I handed Chopper’s leash to his owner and walked beside them. Both dogs fell into a nice heel, needing only minimal corrections. Her owner said it had been a few years since she had walked them together so I was proud to see her walking them both with complete control and confidence. Now this walk was at 9 PM so there were few distractions which obviously made things easier. I suggested that their owner take them for walks this time of day and also stop and ask the dogs to sit at random intervals. Since both dogs are dog reactive, going for a walk at this time of day is a great way to practice following their owner’s commands to sit and walking all at a heel. While the dogs would sit (with some repeated commands or encouragement) in the home, on the walk it was pretty difficult to get them to sit. If you can’t get your dog to execute one of the simplest commands, there is little chance of controlling the dog when it sees something its reactive towards like another dog. With practice under calm conditions with no other dogs around, both dogs will learn to look to and follow the lead of their owner. When we returned to their home, I worked with Chopper on the treadmill. I was able to get him to step up and walk on it, once it was on, he either stopped it from moving or jumped off the side. With other clients who’s dogs behaved the same way, I got the speed of the track up enough where the dog needed to run. This action has always helped me get past this initial hesitation, but due to the limited power of the dog version, both dogs were able to stop the track from moving. I tried a number of different positions, motivation and manipulation but hit a wall in terms of getting the dogs to use the treadmill. This is the first time I have ever ended a session unable to solve a problem so I refused to accept payment despite their owner’s persistence. While she and I were both content with the progress we made with the dog’s manners and behavior, the reason she booked the session was the treadmill. Now that I am scheduling dog behavior sessions in Southern California once a month, I plan on returning to take another crack at getting Chopper and Gia to use the treadmill. I was pleased at the behavior progress as the dogs were much calmer, more responsive and respectful of their owner by the end of the session. But while progress was made and their owner was satisfied, I was not. I refuse to count the inability to get the dogs running on the treadmill as a failure. Instead I will mark this one as … To be continued!